This walk: 2013-4-3. 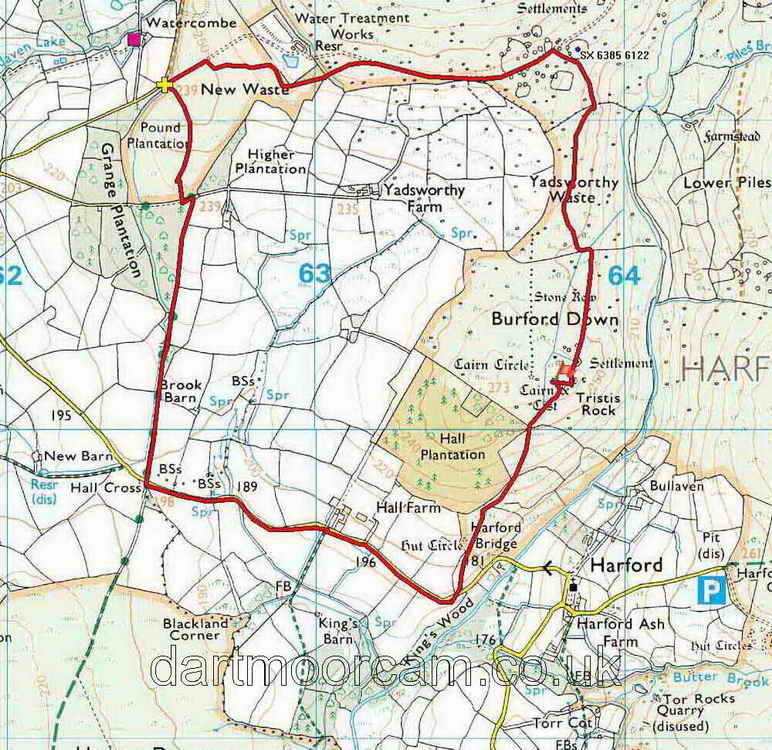 New Waste, Drove Lane, Grange Plantation, Brook Barn, stacked wood, fieldfares, Hall Farm, Elizabeth Chudleigh a.k.a. Lady Kitty Crocodile, primrose, wild daffodils, Tristis Rock, cairn circle and cist, Piles Copse, Hangershell Rock, Hall Plantation, Burford Down, River Erme, Bronze Age enclosures, stone row (from a distance), water treatment works. Link to Google Satellite view of the area - the map almost reflects the map at the bottom of the page. The car park is to the right of the symbol above the head of the "little man" figure at top left. Hall Farm is at centre bottom. The latter stage of the walk was northwards, west of the river running noth-southErme. The walk started from the car park at New Waste. "Waste" is a name for an enclosed area of pasture, like a newtake. : it is a term found on the southern moor. The New Waste area was enclosed illegally in the early 18th Century, according to Eric Hemery (1983), High Dartmoor, Robert Hale, London, page 243. Being close to Watercombe Farm, it is also known as Watercombe Waste. Looking back up Drove Road, the lane alongside Grange Plantation, part of Hall Farm Estate. given to the Woodland Trust by its founder, Kenneth Watkins. Looking ahead, down Drove Road. "Drove" pertains to driving animals .e.g. drover. Brook Barn, SX 6260 6006 (Google satellite view). A stream seen along the way. Stacked wood along the road, near SX 6271 5978. Oh, for a tripod and a long lens ..... a fieldfare. Entrance to Hall Farm, once the seat of the Chudleigh family, of which Elizabeth Chudleigh, who went to the court of King George II, led a very interesting life! She was even contemplating becoming mistress to the King around the period of 1747. Samuel Foote, a comedian, wrote a play depicting her as a licentious woman, calling her Lady Kitty Crocodile (because of her propensity for tears) but after various machinations he was denied a license to produce it. A sign of Spring, a primrose. A gathering in the sunshine. The second entrance to Hall Farm. Approaching Hall Plantation, "the hard way"! Tristis Rock, conquered at last! Zoomed view into the valley, showing the trees of Piles Copse. Zoomed view to Hangershell Rock. Looking back at Tristis Rock from approx. SX 6380 6069. Looking back again with Tristis Rock (left) and Hall Plantation on the hilltop (Burford Down). Zoomed view to Sharp Tor, SX 64883 61708, elevation 414 metres (1358 feet). Overview of the previous photograph. Someone will need a new gate soon ..... wind-sucking is another vice of horses. Approaching a very large Bronze Age enclosure, the centre of which is at SX 63850 61228. Click on the image to see a larger version. This area of the Erme valley possesses a large number of remains. The enclosure (pound) photographed above is Pound C in the figure above. 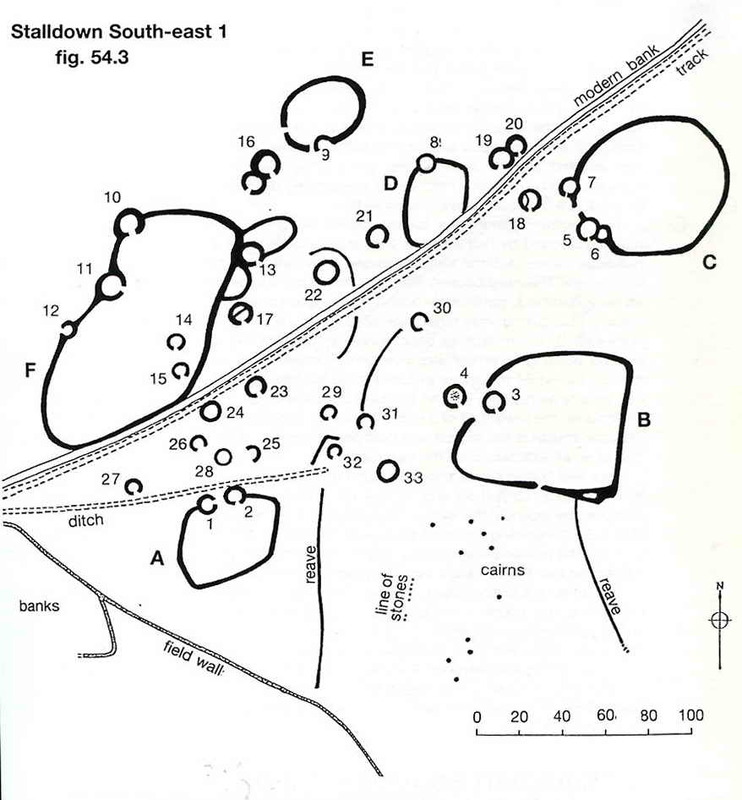 The settlement is described by Jeremy Butler (1993), Dartmoor Atlas of Antiquities, Vol. 4, The South-East, 54.4: Stalldown south-east 1, fig. 54.3, pages 41-42. Looking back to Hall Plantation, where Tristis Rock is out of the photograph (to the left) at some cleared gorse and bracken threough which runs a long stone row. This alignment is north-south (as are others in the area) and is 508 metres in length. The terminal cairn on the top of the hill is 90 metres west of the cairn circle and cist seen above near Tristis Rock. The row is described by Jeremy Butler (1993), Dartmoor Atlas of Antiquities, Vol. 4, The South-East, 54.17: Burford Down stone row and cairns, fig. 54.18, pages 58-60. Click on the image to see a larger version. The reservoir above Harford Moor Gate, this is surrounded by the clump of trees in the mid-line of the photograph above, in the distance. This walk was reached via Cornwood, heading north-east from the village square, taking the third road on the left (at Torr) - ignore a small green lane shortly following the first road on the left. After turning left at Torr, immediately turn right, finally bearing left (don't bear right to Yadsworthy Farm) to the car park at the yellow cross symbol on the map above. Distance - 6.19 km / 3.85 miles.